Art has long formed part of Vacances Bleues’ vision of the finer things in life. For proof of this, look no further than the permanent exhibition of works from our collection in our offices and hotels: an ‘extra’ that costs nothing, apart from a little of your time to stop and stare. Take the chance to stroll throughout the Provinces Opéra Hotel, pausing to admire a whole series of contemporary art and design works, including photographs by Georges Rousse, Massimo Vitali and Sophie Calle, and ‘Alter Ago’, an installation by designer Etienne Rey. 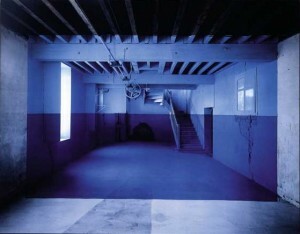 Rey’s work explores the notion of space. His installations are an invitation to experience the phenomenon differently, in a new dimension based on our perceptions. The artist’s work – on display at the Provinces Opéra Hotel – was completed in 2012 for the Vacances Bleues Foundation. It consists of four vertical sections positioned at the entrances to the room. The mirrors created around spirals reframe the visual space, reflecting fragments of the glass roof behind the viewer, and creating an effect that depends both on the onlooker’s position and the natural light. 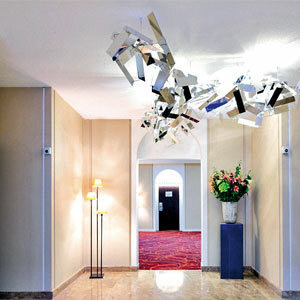 In the centre, at the passageway between the hall and the lounge, the suspended image captures the idea of ‘flow’.